"Perspective projection" redirects here. For a more mathematical treatment, see Perspective transform. Perspective (from Latin: perspicere "to see through") in the graphic arts is an approximate representation, generally on a flat surface (such as paper), of an image as it is seen by the eye. The two most characteristic features of perspective are that objects appear smaller as their distance from the observer increases; and that they are subject to foreshortening, meaning that an object's dimensions along the line of sight appear shorter than its dimensions across the line of sight. Italian Renaissance painters and architects including Filippo Brunelleschi, Masaccio, Paolo Uccello, Piero della Francesca and Luca Pacioli studied linear perspective, wrote treatises on it, and incorporated it into their artworks, thus contributing to the mathematics of art. Rays of light travel from the object, through the picture plane, and to the viewer's eye. This is the basis for graphical perspective. Linear perspective always works by representing the light that passes from a scene through an imaginary rectangle (realized as the plane of the painting), to the viewer's eye, as if a viewer were looking through a window and painting what is seen directly onto the windowpane. If viewed from the same spot as the windowpane was painted, the painted image would be identical to what was seen through the unpainted window. Each painted object in the scene is thus a flat, scaled down version of the object on the other side of the window. Because each portion of the painted object lies on the straight line from the viewer's eye to the equivalent portion of the real object it represents, the viewer sees no difference (sans depth perception) between the painted scene on the windowpane and the view of the real scene. All perspective drawings assume the viewer is a certain distance away from the drawing. Objects are scaled relative to that viewer. An object is often not scaled evenly: a circle often appears as an ellipse and a square can appear as a trapezoid. This distortion is referred to as foreshortening. Perspective drawings have a horizon line, which is often implied. This line, directly opposite the viewer's eye, represents objects infinitely far away. They have shrunk, in the distance, to the infinitesimal thickness of a line. It is analogous to (and named after) the Earth's horizon. Any perspective representation of a scene that includes parallel lines has one or more vanishing points in a perspective drawing. 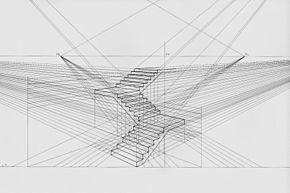 A one-point perspective drawing means that the drawing has a single vanishing point, usually (though not necessarily) directly opposite the viewer's eye and usually (though not necessarily) on the horizon line. All lines parallel with the viewer's line of sight recede to the horizon towards this vanishing point. This is the standard "receding railroad tracks" phenomenon. A two-point drawing would have lines parallel to two different angles. Any number of vanishing points are possible in a drawing, one for each set of parallel lines that are at an angle relative to the plane of the drawing. The earliest art paintings and drawings typically sized many objects and characters hierarchically according to their spiritual or thematic importance, not their distance from the viewer, and did not use foreshortening. The most important figures are often shown as the highest in a composition, also from hieratic motives, leading to the so-called "vertical perspective", common in the art of Ancient Egypt, where a group of "nearer" figures are shown below the larger figure or figures. The only method to indicate the relative position of elements in the composition was by overlapping, of which much use is made in works like the Parthenon Marbles. Chinese artists made use of oblique perspective from the first or second century until the 18th century. It is not certain how they came to use the technique; some authorities suggest that the Chinese acquired the technique from India, which acquired it from Ancient Rome. Oblique projection is also seen in Japanese art, such as in the Ukiyo-e paintings of Torii Kiyonaga (1752–1815). In the 18th century, Chinese artists began to combine oblique perspective with regular diminution of size of people and objects with distance; no particular vantage point is chosen, but a convincing effect is achieved. Systematic attempts to evolve a system of perspective are usually considered to have begun around the fifth century BC in the art of ancient Greece, as part of a developing interest in illusionism allied to theatrical scenery. This was detailed within Aristotle's Poetics as skenographia: using flat panels on a stage to give the illusion of depth. The philosophers Anaxagoras and Democritus worked out geometric theories of perspective for use with skenographia. Alcibiades had paintings in his house designed using skenographia, so this art was not confined merely to the stage. 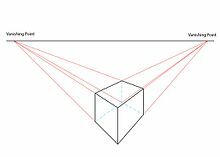 Euclid's Optics introduced a mathematical theory of perspective, but there is some debate over the extent to which Euclid's perspective coincides with the modern mathematical definition. Various paintings and drawings from the Middle Ages show amateur attempts at projections of objects, where parallel lines are successfully represented in isometric projection, or by nonparallel ones without a vanishing point. By the later periods of antiquity, artists, especially those in less popular traditions, were well aware that distant objects could be shown smaller than those close at hand for increased realism, but whether this convention was actually used in a work depended on many factors. Some of the paintings found in the ruins of Pompeii show a remarkable realism and perspective for their time. It has been claimed that comprehensive systems of perspective were evolved in antiquity, but most scholars do not accept this. Hardly any of the many works where such a system would have been used have survived. A passage in Philostratus suggests that classical artists and theorists thought in terms of "circles" at equal distance from the viewer, like a classical semi-circular theatre seen from the stage. The roof beams in rooms in the Vatican Virgil, from about 400 AD, are shown converging, more or less, on a common vanishing point, but this is not systematically related to the rest of the composition. In the Late Antique period use of perspective techniques declined. The art of the new cultures of the Migration Period had no tradition of attempting compositions of large numbers of figures and Early Medieval art was slow and inconsistent in relearning the convention from classical models, though the process can be seen underway in Carolingian art. Medieval artists in Europe, like those in the Islamic world and China, were aware of the general principle of varying the relative size of elements according to distance, but even more than classical art was perfectly ready to override it for other reasons. Buildings were often shown obliquely according to a particular convention. The use and sophistication of attempts to convey distance increased steadily during the period, but without a basis in a systematic theory. Byzantine art was also aware of these principles, but also had the reverse perspective convention for the setting of principal figures. In about 1413 a contemporary of Ghiberti, Filippo Brunelleschi, demonstrated the geometrical method of perspective, used today by artists, by painting the outlines of various Florentine buildings onto a mirror. When the building's outline was continued, he noticed that all of the lines converged on the horizon line. According to Vasari, he then set up a demonstration of his painting of the Baptistery in the incomplete doorway of the Duomo. He had the viewer look through a small hole on the back of the painting, facing the Baptistery. He would then set up a mirror, facing the viewer, which reflected his painting. To the viewer, the painting of the Baptistery and the building itself were nearly indistinguishable. Soon after, nearly every artist in Florence and in Italy used geometrical perspective in their paintings, notably Paolo Uccello, Masolino da Panicale and Donatello. Donatello started sculpting elaborate checkerboard floors into the simple manger portrayed in the birth of Christ. Although hardly historically accurate, these checkerboard floors obeyed the primary laws of geometrical perspective: the lines converged approximately to a vanishing point, and the rate at which the horizontal lines receded into the distance was graphically determined. This became an integral part of Quattrocento art. Melozzo da Forlì first used the technique of upward foreshortening (in Rome, Loreto, Forlì and others), and was celebrated for that. Not only was perspective a way of showing depth, it was also a new method of composing a painting. Paintings began to show a single, unified scene, rather than a combination of several. As shown by the quick proliferation of accurate perspective paintings in Florence, Brunelleschi likely understood (with help from his friend the mathematician Toscanelli), but did not publish, the mathematics behind perspective. Decades later, his friend Leon Battista Alberti wrote De pictura (1435/1436), a treatise on proper methods of showing distance in painting. Alberti's primary breakthrough was not to show the mathematics in terms of conical projections, as it actually appears to the eye. Instead, he formulated the theory based on planar projections, or how the rays of light, passing from the viewer's eye to the landscape, would strike the picture plane (the painting). He was then able to calculate the apparent height of a distant object using two similar triangles. The mathematics behind similar triangles is relatively simple, having been long ago formulated by Euclid. 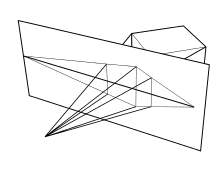 In viewing a wall, for instance, the first triangle has a vertex at the user's eye, and vertices at the top and bottom of the wall. The bottom of this triangle is the distance from the viewer to the wall. The second, similar triangle, has a point at the viewer's eye, and has a length equal to the viewer's eye from the painting. The height of the second triangle can then be determined through a simple ratio, as proven by Euclid. Alberti was also trained in the science of optics through the school of Padua and under the influence of Biagio Pelacani da Parma who studied Alhazen's Book of Optics  (see what was noted above in this regard with respect to Ghiberti). Alhazen's Book of Optics, translated around 1200 into Latin, laid the mathematical foundation for perspective in Europe. Piero della Francesca elaborated on De pictura in his De Prospectiva Pingendi in the 1470s, making many references to Euclid. Alberti had limited himself to figures on the ground plane and giving an overall basis for perspective. Della Francesca fleshed it out, explicitly covering solids in any area of the picture plane. Della Francesca also started the now common practice of using illustrated figures to explain the mathematical concepts, making his treatise easier to understand than Alberti's. Della Francesca was also the first to accurately draw the Platonic solids as they would appear in perspective. Luca Pacioli's 1509 De divina proportione (On Divine Proportion), illustrated by Leonardo da Vinci, summarized the use of perspective in painting. Perspective remained, for a while, the domain of Florence. Jan van Eyck, among others, was unable to create a consistent structure for the converging lines in paintings, as in London's The Arnolfini Portrait, because he was unaware of the theoretical breakthrough just then occurring in Italy. However he achieved very subtle effects by manipulations of scale in his interiors. Gradually, and partly through the movement of academies of the arts, the Italian techniques became part of the training of artists across Europe, and later other parts of the world. The culmination of these Renaissance traditions finds its ultimate synthesis in the research of the 17th century architect, geometer, and optician Girard Desargues on perspective, optics and projective geometry. Further advances in projective geometry, in the 19th and 20th centuries, led to the development of analytic geometry, algebraic geometry, relativity and quantum mechanics. CAD software, and some computer games (especially games using 3-D polygons) use linear algebra, and in particular matrix multiplication, to create a sense of perspective. The scene is a set of points, and these points are projected to a plane (computer screen)[dubious – discuss] in front of the view point (the viewer's eye). The problem of perspective is simply finding the corresponding coordinates on the plane corresponding to the points in the scene. By the theories of linear algebra, a matrix multiplication directly computes the desired coordinates, thus bypassing any descriptive geometry theorems used in perspective drawing. [dubious – discuss]. Of the many types of perspective drawings, the most common categorizations of artificial perspective are one-, two- and three-point. The names of these categories refer to the number of vanishing points in the perspective drawing. A drawing has one-point perspective when it contains only one vanishing point on the horizon line. This type of perspective is typically used for images of roads, railway tracks, hallways, or buildings viewed so that the front is directly facing the viewer. Any objects that are made up of lines either directly parallel with the viewer's line of sight or directly perpendicular (the railroad slats) can be represented with one-point perspective. These parallel lines converge at the vanishing point. One-point perspective exists when the picture plane is parallel to two axes of a rectilinear (or Cartesian) scene – a scene which is composed entirely of linear elements that intersect only at right angles. If one axis is parallel with the picture plane, then all elements are either parallel to the picture plane (either horizontally or vertically) or perpendicular to it. All elements that are parallel to the picture plane are drawn as parallel lines. All elements that are perpendicular to the picture plane converge at a single point (a vanishing point) on the horizon. A drawing has two-point perspective when it contains two vanishing points on the horizon line. In an illustration, these vanishing points can be placed arbitrarily along the horizon. Two-point perspective can be used to draw the same objects as one-point perspective, rotated: looking at the corner of a house, or at two forked roads shrinking into the distance, for example. One point represents one set of parallel lines, the other point represents the other. Seen from the corner, one wall of a house would recede towards one vanishing point while the other wall recedes towards the opposite vanishing point. Two-point perspective exists when the painting plate is parallel to a Cartesian scene in one axis (usually the z-axis) but not to the other two axes. If the scene being viewed consists solely of a cylinder sitting on a horizontal plane, no difference exists in the image of the cylinder between a one-point and two-point perspective. 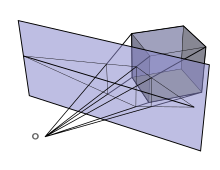 Two-point perspective has one set of lines parallel to the picture plane and two sets oblique to it. Parallel lines oblique to the picture plane converge to a vanishing point, which means that this set-up will require two vanishing points. Two-point perspective was demonstrated as early as 1525 by Albrecht Dürer, who studied perspective by reading Piero and Pacioli's works, in his Unterweisung der messung ("Instruction of the measurement"). The Palazzo del Lavoro in Mussolini's Esposizione Universale Roma complex, photographed in three-point perspective. All three axes are oblique to the picture plane; the three vanishing points are at the zenith, and on the horizon to the right and left. Three-point perspective is often used for buildings seen from above (or below). In addition to the two vanishing points from before, one for each wall, there is now one for how the vertical lines of the walls recede. For an object seen from above, this third vanishing point is below the ground. For an object seen from below, as when the viewer looks up at a tall building, the third vanishing point is high in space. Three-point perspective exists when the perspective is a view of a Cartesian scene where the picture plane is not parallel to any of the scene's three axes. Each of the three vanishing points corresponds with one of the three axes of the scene. One, two and three-point perspectives appear to embody different forms of calculated perspective, and are generated by different methods. Mathematically, however, all three are identical; the difference is merely in the relative orientation of the rectilinear scene to the viewer. Four-point perspective, also called infinite-point perspective, is the curvilinear (see curvilinear perspective) variant of two-point perspective. A four-point perspective image can represent a 360° panorama, and even beyond 360° to depict impossible scenes. This perspective can be used with either a horizontal or a vertical horizon line: in the latter configuration it can depict both a worm's-eye and bird's-eye view of a scene at the same time. Like all other foreshortened variants of perspective (one-point to six-point perspectives), it starts off with a horizon line, followed by four equally spaced vanishing points to delineate four vertical lines. The vanishing points made to create the curvilinear orthogonals are thus made ad hoc on the four vertical lines placed on the opposite side of the horizon line. The only dimension not foreshortened in this type of perspective is that of the rectilinear and parallel lines perpendicular to the horizon line – similar to the vertical lines used in two-point perspective. One-point, two-point, and three-point perspective are dependent on the structure of the scene being viewed. These only exist for strict Cartesian (rectilinear) scenes. By inserting into a Cartesian scene a set of parallel lines that are not parallel to any of the three axes of the scene, a new distinct vanishing point is created. Therefore, it is possible to have an infinite-point perspective if the scene being viewed is not a Cartesian scene but instead consists of infinite pairs of parallel lines, where each pair is not parallel to any other pair. In its usual sense, zero-point perspective is not truly "zero-point". Rather, because vanishing points exist only when parallel lines are present in the scene, a perspective with no vanishing points ("zero-point" perspective) occurs if the viewer is observing a non-linear scene containing no parallel lines. The most common example of such a nonlinear scene is a natural scene (e.g., a mountain range) which frequently does not contain any parallel lines. This is not to be confused with elevation, since a view without explicit vanishing points may still have been drawn such that, there would have been vanishing points had there been parallel lines, and thus enjoy the sense of depth as a perspective projection. On the other hand, parallel projection such as elevation can be approximated by viewing the object in question from very far away, because projection lines from the point of view approaches parallel when the point of view (POV) approaches infinity. This may account for the confusion over zero-point perspective, since natural scenes often are viewed from very far away, and the size of objects within the scene would be insignificant compared to their distance to the POV. Any given small objects in said scene would thus mimic the look of parallel projection. Foreshortening is the visual effect or optical illusion that causes an object or distance to appear shorter than it actually is because it is angled toward the viewer. Additionally, an object is often not scaled evenly: a circle often appears as an ellipse and a square can appear as a trapezoid. Although foreshortening is an important element in art where visual perspective is being depicted, foreshortening occurs in other types of two-dimensional representations of three-dimensional scenes. Some other types where foreshortening can occur include oblique parallel projection drawings. Foreshortening also occurs when imaging rugged terrain using a synthetic aperture radar system. In painting, foreshortening in the depiction of the human figure was perfected in the Italian Renaissance, and the Lamentation over the Dead Christ by Andrea Mantegna (1480s) is one of the most famous of a number of works that show off the new technique, which thereafter became a standard part of the training of artists. Rays of light travel from the object to the eye, intersecting with a notional picture plane. One of the most common, and earliest, uses of geometrical perspective is a checkerboard floor. It is a simple but striking application of one-point perspective. Many of the properties of perspective drawing are used while drawing a checkerboard. The checkerboard floor is, essentially, just a combination of a series of squares. Once a single square is drawn, it can be widened or subdivided into a checkerboard. Where necessary, lines and points will be referred to by their colors in the diagram. To draw a square in perspective, the artist starts by drawing a horizon line (black) and determining where the vanishing point (green) should be. The higher up the horizon line is, the lower the viewer will appear to be looking, and vice versa. The more off-center the vanishing point, the more tilted the square will be. Because the square is made up of right angles, the vanishing point should be directly in the middle of the horizon line. A rotated square is drawn using two-point perspective, with each set of parallel lines leading to a different vanishing point. The foremost edge of the (orange) square is drawn near the bottom of the painting. Because the viewer's picture plane is parallel to the bottom of the square, this line is horizontal. Lines connecting each side of the foremost edge to the vanishing point are drawn (in grey). These lines give the basic, one point "railroad tracks" perspective. The closer it is the horizon line, the farther away it is from the viewer, and the smaller it will appear. The farther away from the viewer it is, the closer it is to being perpendicular to the picture plane. A new point (the eye) is now chosen, on the horizon line, either to the left or right of the vanishing point. The distance from this point to the vanishing point represents the distance of the viewer from the drawing. If this point is very far from the vanishing point, the square will appear squashed, and far away. If it is close, it will appear stretched out, as if it is very close to the viewer. A line connecting this point to the opposite corner of the square is drawn. Where this (blue) line hits the side of the square, a horizontal line is drawn, representing the farthest edge of the square. The line just drawn represents the ray of light traveling from the farthest edge of the square to the viewer's eye. This step is key to understanding perspective drawing. The light that passes through the picture plane obviously can not be traced. Instead, lines that represent those rays of light are drawn on the picture plane. In the case of the square, the side of the square also represents the picture plane (at an angle), so there is a small shortcut: when the line hits the side of the square, it has also hit the appropriate spot in the picture plane. The (blue) line is drawn to the opposite edge of the foremost edge because of another shortcut: since all sides are the same length, the foremost edge can stand in for the side edge. Original formulations used, instead of the side of the square, a vertical line to one side, representing the picture plane. Each line drawn through this plane was identical to the line of sight from the viewer's eye to the drawing, only rotated around the y-axis ninety degrees. It is, conceptually, an easier way of thinking of perspective. It can be easily shown that both methods are mathematically identical, and result in the same placement of the farthest side. Plato was one of the first to discuss the problems of perspective. "Thus (through perspective) every sort of confusion is revealed within us; and this is that weakness of the human mind on which the art of conjuring and of deceiving by light and shadow and other ingenious devices imposes, having an effect upon us like magic... And the arts of measuring and numbering and weighing come to the rescue of the human understanding – there is the beauty of them – and the apparent greater or less, or more or heavier, no longer have the mastery over us, but give way before calculation and measure and weight?" Epimetheus (lower left) and Janus (right). The two moons appear close because of foreshortening; in reality, Janus is about 40,000 km (two hundred times the width of Janus) farther from the observer than Epimetheus. Perspective images are calculated assuming a particular vanishing point. In order for the resulting image to appear identical to the original scene, a viewer of the perspective must view the image from the exact vantage point used in the calculations relative to the image. This cancels out what would appear to be distortions in the image when viewed from a different point. These apparent distortions are more pronounced away from the center of the image as the angle between a projected ray (from the scene to the eye) becomes more acute relative to the picture plane. In practice, unless the viewer chooses an extreme angle, like looking at it from the bottom corner of the window, the perspective normally looks more or less correct. This is referred to as "Zeeman's Paradox". It has been suggested that a drawing in perspective still seems to be in perspective at other spots because we still perceive it as a drawing, because it lacks depth of field cues. For a typical perspective, however, the field of view is narrow enough (often only 60 degrees) that the distortions are similarly minimal enough that the image can be viewed from a point other than the actual calculated vantage point without appearing significantly distorted. When a larger angle of view is required, the standard method of projecting rays onto a flat picture plane becomes impractical. As a theoretical maximum, the field of view of a flat picture plane must be less than 180 degrees (as the field of view increases towards 180 degrees, the required breadth of the picture plane approaches infinity). To create a projected ray image with a large field of view, one can project the image onto a curved surface. To have a large field of view horizontally in the image, a surface that is a vertical cylinder (i.e., the axis of the cylinder is parallel to the z-axis) will suffice (similarly, if the desired large field of view is only in the vertical direction of the image, a horizontal cylinder will suffice). A cylindrical picture surface will allow for a projected ray image up to a full 360 degrees in either the horizontal or vertical dimension of the perspective image (depending on the orientation of the cylinder). In the same way, by using a spherical picture surface, the field of view can be a full 360 degrees in any direction (note that for a spherical surface, all projected rays from the scene to the eye intersect the surface at a right angle). ^ There is a general attempt to reduce the size of more distant elements, but unsystematically. Sections of the composition are at a similar scale, with relative distance shown by overlapping, foreshortening, and further objects being higher than nearer ones, though the workmen at left do show finer adjustment of size. This is abandoned on the right where the most important figure is much larger than the mason. Rectangular buildings and the blocks of stone are shown obliquely. ^ "Linear Perspective: Brunelleschi's Experiment". Smarthistory at Khan Academy. Archived from the original on 24 May 2013. Retrieved 12 May 2013. ^ "How One-Point Linear Perspective Works". Smarthistory at Khan Academy. Archived from the original on 13 July 2013. Retrieved 12 May 2013. ^ "Empire of the Eye: The Magic of Illusion: The Trinity-Masaccio, Part 2". National Gallery of Art at ArtBabble. Archived from the original on 1 May 2013. Retrieved 12 May 2013. ^ D'Amelio, Joseph (2003). Perspective Drawing Handbook. Dover. p. 19. ^ a b c Cucker, Felix (2013). Manifold Mirrors: The Crossing Paths of the Arts and Mathematics. Cambridge University Press. pp. 269–278. ISBN 978-0-521-72876-8. Dubery and Willats (1983:33) write that 'Oblique projection seems to have arrived in China from Rome by way of India round about the first or second century AD.' Figure 10.9 [Wen-Chi returns home, anon, China, 12th century] shows an archetype of the classical use of oblique perspective in Chinese painting. ^ "Skenographia in Fifth Century". CUNY. Archived from the original on 17 December 2007. Retrieved 27 December 2007. ^ "Pompeii. House of the Vettii. Fauces and Priapus". SUNY Buffalo. Archived from the original on 24 December 2007. Retrieved 27 December 2007. ^ Panofsky, Erwin (1960). Renaissance and Renascences in Western Art. Stockholm: Almqvist & Wiksell. p. 122, note 1. ISBN 0-06-430026-9. ^ "...and these works (of perspective by Brunelleschi) were the means of arousing the minds of the other craftsmen, who afterwards devoted themselves to this with great zeal." ^ "Messer Paolo dal Pozzo Toscanelli, having returned from his studies, invited Filippo with other friends to supper in a garden, and the discourse falling on mathematical subjects, Filippo formed a friendship with him and learned geometry from him." ^ El-Bizri, Nader (2010). "Classical Optics and the Perspectiva Traditions Leading to the Renaissance". In Hendrix, John Shannon; Carman, Charles H. (eds.). Renaissance Theories of Vision (Visual Culture in Early Modernity). Farnham, Surrey: Ashgate. pp. 11–30. ISBN 1-409400-24-7. ^ Hans, Belting (2011). Florence and Baghdad: Renaissance art and Arab science (1st English ed.). Cambridge, Massachusetts: Belknap Press of Harvard University Press. pp. 90–92. ISBN 9780674050044. OCLC 701493612. ^ Livio, Mario (2003). The Golden Ratio. New York: Broadway Books. p. 126. ISBN 0-7679-0816-3. ^ O'Connor, J. J.; Robertson, E. F. (July 1999). "Luca Pacioli". University of St Andrews. Archived from the original on 22 September 2015. Retrieved 23 September 2015. ^ MacKinnon, Nick (1993). "The Portrait of Fra Luca Pacioli". The Mathematical Gazette. 77 (479): 206. doi:10.2307/3619717. ^ Basant Agrawal (2008). Engineering Drawing. Tata McGraw-Hill Education. pp. 17.3.4. ISBN 978-0-07-066863-8. Archived from the original on 23 December 2017. ^ Mathographics by Robert Dixon New York: Dover, p. 82, 1991. ^ "...the paradox is purely conceptual: it assumes we view a perspective representation as a retinal simulation, when in fact we view it as a two dimensional painting. In other words, perspective constructions create visual symbols, not visual illusions. The key is that paintings lack the depth of field cues created by binocular vision; we are always aware a painting is flat rather than deep. And that is how our mind interprets it, adjusting our understanding of the painting to compensate for our position." Damisch, Hubert (1994). The Origin of Perspective, Translated by John Goodman. Cambridge, Massachusetts: MIT Press. Pérez-Gómez, Alberto, and Pelletier, Louise (1997). Architectural Representation and the Perspective Hinge. Cambridge, Massachusetts: MIT Press. Gill, Robert W (1974). Perspective From Basic to Creative. Australia: Thames & Hudson. Wikimedia Commons has media related to Perspective. 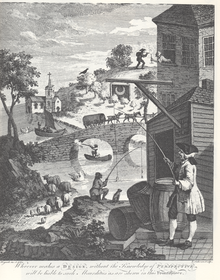 Wikimedia Commons has media related to Evolution of Perspective. This page was last edited on 21 April 2019, at 07:48 (UTC).